Cumbria Community Foundation is calling for community groups in West Allerdale to apply for grants from the Robin Rigg West Cumbria Fund. Funded by an annual donation from E.ON UK, the Robin Rigg off-shore wind farm developer, the community fund operates from Workington to Silloth and inland to Embleton. Money from the pot supports groups undertaking activities that contribute to reducing the effects of climate change and benefit the local community. Grants of between £1,000 and £15,000 are available and applications are being accepted up until Friday January 2nd 2015. 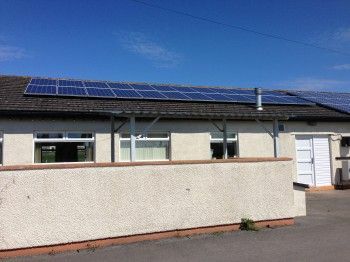 Earlier this year Silloth Rugby Union Club received £11,788 to install solar panels on to their club house. Overall, 32 solar panels were installed onto the roof of the club. Due to the Government’s Feed-In Tariff, the Government pays the club for the electricity they generate. This has meant that as well as not having to worry about electricity bills, the club is getting income from the panels. Use of the flood lights at the club is now a more common occurrence; this has improved training dramatically as the players are able to stay out as long as they want. The club is often used by the community as well. The solar panels have allowed the club to charge a reduced fee to people that want to hire it for functions as they are saving money on their electricity. As well as the financial benefits of the solar panels, the club has been able to educate the younger players on the importance of being green and reducing their carbon footprint. Overall the club has estimated a financial benefit of £29,617 over 20 years.